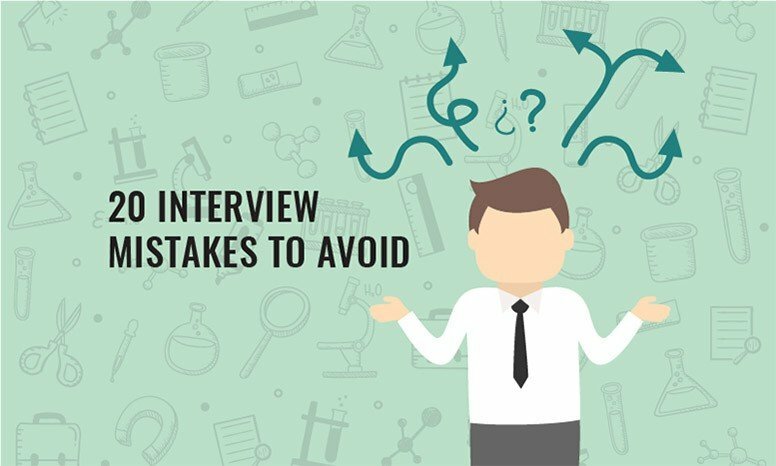 Job Interview Tips for Pharma | 20 Common Mistakes You Should Avoid! So all your hard work has finally paid off and you have a number of job interviews lined up over the next few weeks. However, for some of you, it may have been a long time since you last did a formal job interview. So what shouldn’t you do? Let us take you through the most common job interview mistakes and our tips for avoiding them. There are many different ways that companies conduct interviews – there are lots of ways they can ask you about your past work experiences and your reasons for wanting their job. Some questions can be a little tricky if you’re unprepared – asking difficult questions is a great way for an interviewer to see how you cope under pressure, and often more likely to force you into an honest answer. By preempting these difficult questions you can prepare for how you might answer them. This way, your answers will sound more confident. There is a huge amount of material out there on how to best prepare for a job interview, here is one particular link we like but there are many others. If at any point you are unsure about a question, don’t be afraid to ask for some clarification. It’s MUCH better to do that before you begin an answer. When you interview for a job, it’s imperative to look professional and polished. Although your everyday working attire may vary based on the position you’re applying for, it’s important to look well-dressed and put together for an interview, no matter what the company. In the pharmaceutical and medical device industries, always go with professional attire. Everyone knows that first impressions are very important – make sure you don’t make a bad first impression before you even arrive. Running late not only suggests poor time management skills, but it shows a lack of respect for the company, the position, and even your interviewer. It also does away with some very important time to gather your thoughts. Go the extra length to make sure that you aren’t late – in fact, aim to be early. Plan your time so you make it to the interview location about 15 minutes before the scheduled start time. That way, if something unforeseen comes up on your way, you have some time in hand. It’s always good to give yourself a little time waiting at the location to calm any nerves and focus your thoughts towards all that preparation you’ve been doing. Once you’re in that interview room, the only things you should be thinking about are the questions being asked and your answers. Distractions come in many forms – there are some you can control and some you can’t. It is your responsibility to ensure you’ve dealt with all the ones you can control, both before you enter the room and throughout your time with the interviewer. Before you go in, deal with any outside distractions – switch off your mobile phone (or at the very least ensure it’s silenced). Once in the room, keep your focus on the interviewer. It can be really easy to anticipate what you think they’re going to ask or what you want them to ask and answer that. Really listen to the question. Take a second to consider your answer and give it, making sure you address all parts of the question. If you’re finding it difficult to stop your mind from racing and distracting you, try sitting forward in your chair and employ some good ‘active listening’ techniques. If you find that your interviewer is the one who seems distracted or disorganized then it’s even more important that you focus on making your ‘key facts’ heard and remembered. One of the biggest mistakes you can make is not knowing what your own strengths/weaknesses are compared to the job role requirements. It’s such an easy one to avoid – there’s really no excuse. Before the interview, take your time to work through the job advert again and identify the areas you think you’re strongest so you can emphasize them to an interviewer. But equally important is to identify the areas where you’re weaker, so you can prepare a succinct and effective way to address these concerns. Even if an employer doesn’t explicitly mention your weaknesses, they will have noticed them and may ask questions about them. Being acutely aware of what your weaknesses are, gives you the opportunity to spot when you’re inadvertently being asked about them and to confidently address them. “What do you know about this company?” It’s often one of the first questions an interviewer will ask. It’s a good way to start, to assess your level of interest in this specific role and it soon sorts out those who want a job from the ones who want this job. Most companies have a website; most company websites have an ‘About us’ section. As an absolute minimum, you should know the content of that page. You can also look for the company’s presence on social media (e.g LinkedIn, Facebook, etc), this will often give you big clues about their current strategies. Also, put the company’s name and ‘news’ into a search engine to see if there’s anything current you should know about.But once you’re in the interview, do more than just relay a list of facts back to the interviewer – take the opportunity to shine. When discussing what you’ve learned, you should tell them why knowing this makes you want to work for them, what makes you a good fit or what can you add to the pursuit of their company goals. You can easily use this question to get an excellent start to your interview – make sure you make the most of it! We’ve spoken at great length about the need for a personal pitch. But it’s not just a nice way to introduce yourself at networking events, it’s also a great base from which to answer the often asked “tell me a little about yourself” question. Brushing up on your personal pitch beforehand (ideally with a little tailoring specific to this role) will ensure that you hit the employer with your “key messages” in a succinct and thoughtful way. Even if you submitted a resume when you applied for the job, you may also be asked to fill out a job application. Stumbling to remember your own past doesn’t make a great impression and may even lead people to wonder how honest you’ve been. Make sure you know the information you will need to complete an application, including dates of prior employment, graduation dates, and employer contact information. It’s understandable that some of your older experiences may be hard to recall so review the facts before going into your interview. It can be helpful to keep a copy of your resume for yourself to refer to during your interview, just be careful not to use it as a crutch. Of course, everything written on your resume should be the truth – the more honest you are on your resume, the better you will be able to discuss your past experience during your interview. Areas such as gaps in your career history can be especially tricky, we discuss dealing with these in point number 4 on our Job Hunting Tips page. Every job selection process is different – you can’t just assume you’ll go for an interview and a few days later hear whether you got the job or not. Companies use all sorts of techniques to ensure they pick the best candidate if you know the process before you start then you’re in a better position to perform well. Ask for specific details about this interview – who will you be interviewing with? Is it just one interviewer or will there be more? What is their role in the company? Will there be any tests/assessments within this interview? How long is the interview scheduled to last? Also, ask about the rest of the process – are they making a selection based on these interviews alone? Is there a second stage of interviewing? Are there tests/assessments to do on a separate occasion? These are all things you are perfectly entitled to ask and should be – having a clear idea of the process lets you confidently focus best on each task in turn with no surprises. “Good” interview answers depend very much on the type of question. Questions about your history require you to identify and relay your transferable skills, competency based (“tell me a time when…”) questions require a STAR format answer, etc. Check out this article on different types of interview questions and spend some time familiarising yourself with the best approaches to answer them. Depending on the style of your interviewer, you might find yourself being asked some rather broad questions. Similarly, you might find yourself being asked some surprisingly specific questions. The key to answering both is the same – and it’s never about giving a broad, vague answer. It’s always worth remembering that one of the key outcomes of an interview, is for the interviewer to assess whether you could be successful in the position. The best way to do this is showing them you have had specific and measurable success before. Without rambling, take some time to lay out detailed and targeted answers that help to show them you are a candidate that succeeds. Instead of just saying “I’m a team player”, give them a specific example of when you were a team player and the results that had. Wouldn’t it be great if an interviewer started the interview by telling you exactly what they were looking for in a candidate so you could be sure to show them that you fit the bill? They pretty much do. Think of the job advert as your cheat sheet for the interview – they’ve told you exactly what skills and qualities they are looking for. It’s unlikely that these will be reiterated in the interview process. You should make a note of the words and phrases used in the job advert (which ones did you use to tailor your application?) and be using them to describe yourself when it’s appropriate to do so in the interview. As you do this, you will be making it easy for the employer to see that you fit the criteria they have set for their desired candidate. Of course, your interview is a time to talk … appropriately. You may feel like you’ve got a lot to say and not much time to say it in, but talking too much really can harm your chances. Rambling can make you look disorganized. Keeping talking can make you look like you’re not paying attention or not able to respond to social cues. Talking about your personal life can make you look unprofessional. Having said all that, saying too little can be just as damaging as saying too much – it’s more about being personally aware than anything else. Listen to each question carefully and consider your answer – it’s better to take a second before you answer than start to answer and realize you’ve misinterpreted the question or not used your best example. When giving long and detailed answers, be sure to keep looking to your interviewer for clues that they’re looking to move on (e.g. Do they keep taking a breath to start to speak? Are they watching a clock?). Don’t feel rushed, just be aware when they are trying to move things along. Don’t ever get sidetracked and start talking about your personal life. Your spouse, your home life or your children are not topics you should delve into, no matter how warm and welcoming your interviewer may be. When you’re asked hard questions, like “Tell me about a time that you didn’t work well with a supervisor. What was the outcome and how would you have changed the outcome?” or “Have you worked with someone you didn’t like? If so, how did you handle it?” never fall into the trap of bad-mouthing other people. It’s sometimes a smaller world than you think, and you just never know who your interviewer might know. You also don’t want the interviewer to think that you might speak that way about his or her company if you leave on terms that aren’t the best. And, most importantly, it’s just not professional. Instead, review how to answer difficult questions. You want your interviewer to know that you can work well with other people and handle conflicts in a mature and effective way. If you have to explain a difficult situation, keep it factual. Keep the explanation as succinct as possible and focus more of your answer on explaining how you went about finding a solution. Keep it positive. The best advice is only to speak about people like they are in the room. Getting on well with your interviewer is a positive thing, you should work to build rapport and come across as someone they would like to spend time within a professional setting. Just don’t get caught in the trap of becoming too familiar – it is still an interview. Becoming too relaxed in an interview setting can be just as dangerous as not relaxing at all – letting your guard down and answering questions without proper thought, using less professional language or making jokes are all things to stay away from. Always remember where you are and what you’re there for. One thing you’ll almost certainly be asked is if you have any questions of your own, make sure you’ve thought of a few relevant, insightful questions to create a good impression and show your genuine interest in the role. One easy mistake to avoid is only thinking of questions that are likely to be covered as an interview progresses, such as “what duties are involved in the role” or “can you tell me a little about the team I’d be working in”. These are both questions you should know the answer to by the end of an interview and you should definitely be asking if the information hasn’t come up naturally. But only having questions like this, that could easily be answered in the scope of a routine interview, could leave you with nothing to ask at the end. Instead, have a few questions lined up that really show you’ve thought about yourself in the role and have considered it fully. Check out this article for a list of questions you might like to consider having “in your back pocket” at the end of an interview. Even if you say everything right, you might still give an interviewer the wrong impression. Similarly, even if an interviewer is saying positive sounding things, ignoring their body language could mean you miss important clues about their doubts about you. No one expects you to become a body language expert overnight but it’s useful to know the basics. Present yourself well – make a confident entrance and offer an equally confident handshake. Maintain good posture, use “open” body language and keep an appropriate level of eye contact. Following up on interviews is something that people often forget about or feel uneasy doing. But if it’s done properly, it can give you a chance to remind an employer about the things they like about, set you apart from all the other candidates they saw that day and give you an opportunity to address any issues or concerns you think they still had about you leaving the interview. Send a brief thank you email to your interview by the close of business on the day of your interview. As a brief example – Thank them for the opportunity to interview, emphasize your continued enthusiasm for the job, highlight 1/2 key strengths and briefly try to address any lingering doubts you think they had. Finish up by reiterating the follow-up timeline as agreed in your interview. Sometimes things really do just take time, especially in recruitment – there are many things that can hold the process up. But if you’ve had your interview and not heard anything back, you shouldn’t just sit back and wait indefinitely. It can be difficult to know what’s for the best – you’ve got to be careful that you don’t ruin all your chances by being seen as annoying with continued, unsolicited contact. Do try to avoid this headache altogether by agreeing on a plan for follow up whilst you’re still in the interview – ask when you should expect to hear, suggest that you’ll call on a certain day for an update if you’ve not heard. If you’re still left unsure, whether it’s after your initial application or after an interview, have a look at this article for some great advice. Whether successful or not, each and every interview is a time to learn. Be sure to ask for specific feedback about your performance. While most people focus on finding out what they did “wrong”, also take the opportunity to find out which things you did well. If you’ve still not managed to land yourself an interview for your ideal job, have a look at our job boards where you’ll find up-to-date pharmaceutical and medical device manufacturing vacancies across Ireland, the UK and Philadelphia, USA. If interested, check out this tool “Is a Pharma Career For Me?” to see how suitable you are for a role in pharmaceutical or medical device manufacturing based on your career and educational history. Take our Academically Accredited Certificate in eBioPharmaChem 30 Week Conversion Course will give you all the knowledge you need to get a start in the industry.